Gilles Deleuze (1925-95) was an influential and provocative twentieth-century thinker who developed and presented an alternative to the image of thought found in traditional philosophy. This volume offers an extensive survey of Deleuze's philosophy by some of his most influential interpreters. The essays give lucid accounts of the fundamental themes of his metaphysical work and its ethical and political implications. They clearly situate his thinking within the philosophical tradition, with detailed studies of his engagements with phenomenology, post-Kantianism and the sciences, and also his interventions in the arts. As well as offering new research on established areas of Deleuze scholarship, several essays address key themes that have not previously been given the attention they deserve in the English-speaking world. Introduction Henry Somers-Hall; 1. Deleuze and the history of philosophy Daniel W. Smith; 2. Difference and repetition James Williams; 3. The Deleuzian reversal of Platonism Miguel Beistegui; 4. Deleuze and Kant Beth Lord; 5. Phenomenology and metaphysics, and chaos: on the fragility of the event in Deleuze Leonard Lawlor; 6. Deleuze and structuralism Francois Dosse; 7. Deleuze and Guattari: Guattareuze and Co. Gary Genosko; 8. Nomadic ethics Rosi Braidotti; 9. Deleuze's political philosophy Paul Patton; 10. Deleuze, mathematics, and realist ontology Manuel Delanda; 11. Deleuze and life John Protevi; 12. Gilles Deleuze's aesthetics of sensation Dorothea Olkowski; 13. Deleuze and literature Ronald Bogue; 14. Deleuze and psychoanalysis Eugene Holland; 15. Deleuze's philosophical heritage: unity, difference, and onto-theology Henry Somers-Hall. 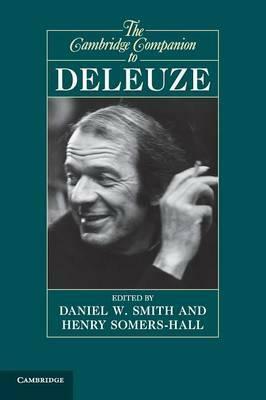 'This collection provides a welcome addition to Deleuze scholarship. Editors Daniel W. Smith and Henry Somers-Hall have compiled an excellent group of essays that simultaneously offers innovative perspectives on, while also providing an extremely helpful point of entry into, a provocative body of work that, precisely because it is provocative, can also appear rather daunting.' Dianna Taylor, Notre Dame Philosophical Reviews '... easily the most detailed, structurally creative, and intellectually motivating introduction to Deleuze's thought currently available.' French Studies 'The Cambridge Companion to Deleuze marks an important milestone in contemporary Continental philosophy.' Foucault Studies 'The fifteen essays assembled in this volume are written by distinguished scholars well known for their expertise on Deleuze (including contributions by the co-editors Somers-Hall and Daniel W. Smith). They collectively provide, as Somers-Hall aptly puts it, a 'rich portrait of the range and sophistication of Deleuze's thinking ...' Eric White, The European Legacy '... the editors have brought together an array of major scholars in the field, in this case to address a range of issues related to Deleuze's work ... Each essay is of high quality ... Recommended ...' A. D. Schrift, CHOICE "This collection provides a welcome addition to Deleuze scholarship. Editors Daniel W. Smith and Henry Somers-Hall have compiled an excellent group of essays that simultaneously offers innovative perspectives on, while also providing an extremely helpful point of entry into, a provocative body of work ... Through the linkages it creates, this volume affirms Deleuze's characterization of philosophy as promoting critique and creation ... the volume does not only create linkages; it opens onto the possibility for existing connections to be critically analyzed and new ones to be made ... this volume affords readers the opportunity to explore the complex relationship an innovative philosopher had to his own intellectual heritage, and how that relationship informs but does not limit his own philosophical innovation ..."
Dianna Taylor, John Carroll University, Notre Dame Philosophical Reviews "... easily the most detailed, structurally creative, and intellectually motivating introduction to Deleuze's thought currently available." Thomas Baldwin, University of Kent, French Studies "The Cambridge Companion to Deleuze marks an important milestone in contemporary Continental philosophy." Foucault Studies 'The fifteen essays assembled in this volume are written by distinguished scholars well known for their expertise on Deleuze (including contributions by the co-editors Somers-Hall and Daniel W. Smith). They collectively provide, as Somers-Hall aptly puts it, a 'rich portrait of the range and sophistication of Deleuze's thinking ...' Eric White, The European Legacy "... the editors have brought together an array of major scholars in the field, in this case to address a range of issues related to Deleuze's work ... Each essay is of high quality ... Recommended ..."
Daniel W. Smith is Associate Professor in the Department of Philosophy at Purdue University, Indiana and is the author of Essays on Deleuze (2012). He is the translator of Gilles Deleuze's Francis Bacon: The Logic of Sensation and Essays Critical and Clinical (with Michael A. Greco, 1998), as well as Pierre Klossowski's Nietzsche and the Vicious Circle (2005) and Isabelle Stenger's The Invention of Modern Science (2000). Henry Somers-Hall is Senior Lecturer in Philosophy at Manchester Metropolitan University. He is the author of Hegel, Deleuze, and the Critique of Representation (2012) and the co-translator (with Nick Midgley, Alistair Welchman and Merten Reglitz) of Salomon Maimon's Essay on Transcendental Philosophy (2010).